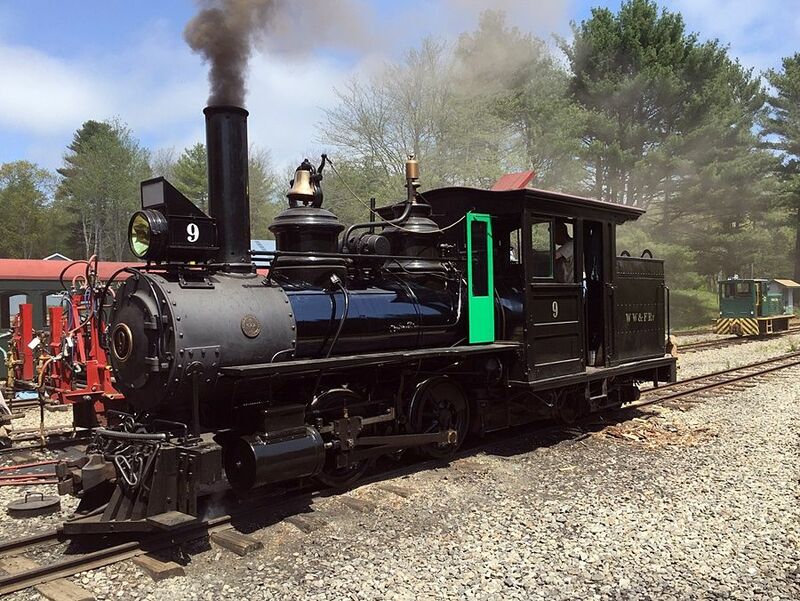 Don't forget Coach 8 and caboose 320, John - the passenger carrying equipment probably comes first, although equipping 309 with a pass-through pipe, as seen in original photos, would be neat for photo shoots. The plan is to equip every piece of rolling stock with operable brakes eventually. We even have a plan to slow the flatcars to switch between a "loaded" setting and an "empty" setting. 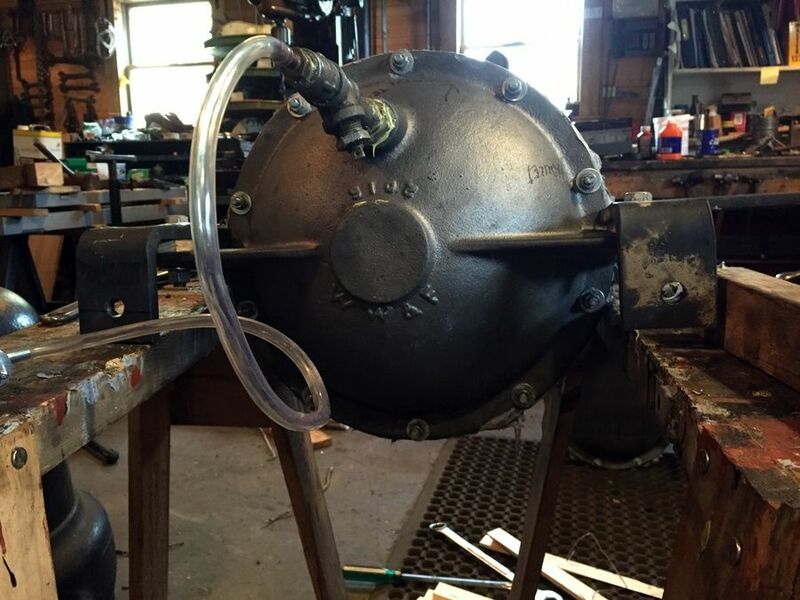 The test equipment set will include one set of engine controls, which we must build from scratch, one set of Eames car couplings, which we have, and one set of coach equipment (2 cylinders- see below, one reservoir- new, piping- new). 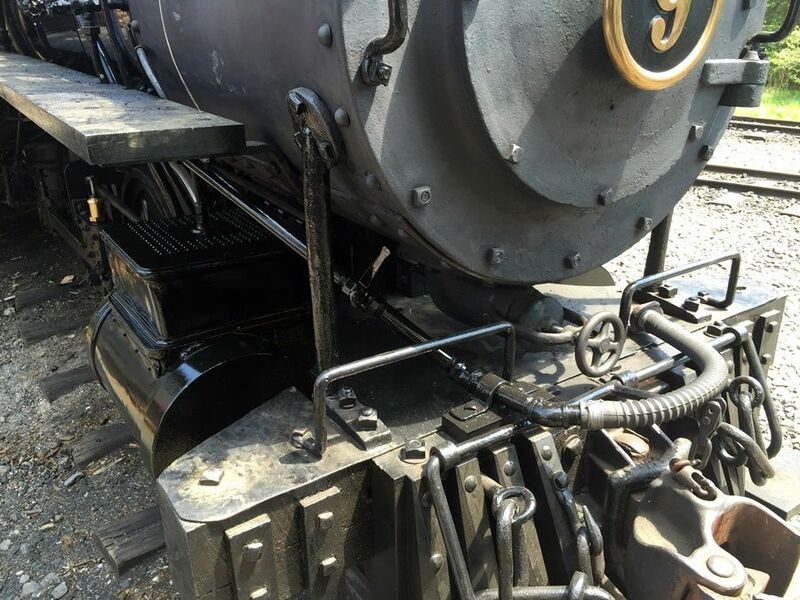 The test locomotive control equipment will be built from common pipe fittings, assembled and appropriately machined, and installed on a steam locomotive. One coach will be outfitted. The test will ensue with that arrangment; if successful, the test locomotive equipment will be moved to 52 for permanent use. 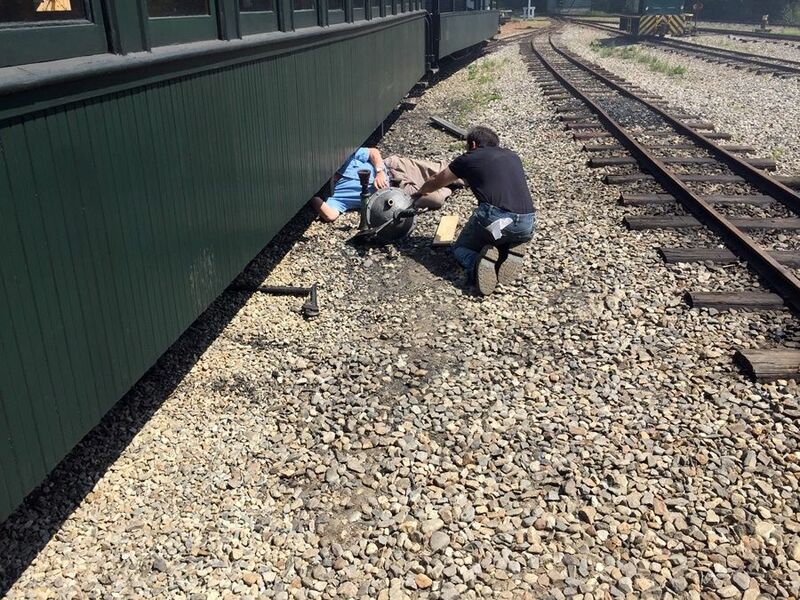 Patterns will be made to cast the locomotive control equipment in bronze. 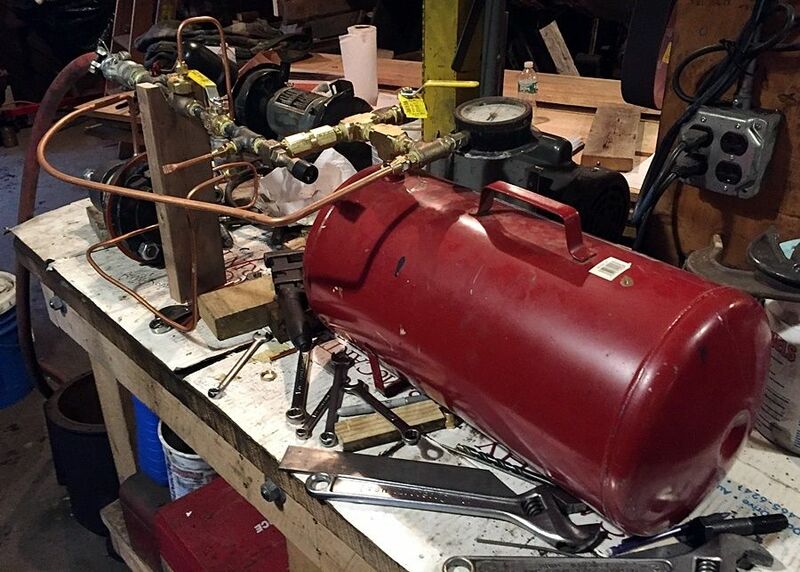 Brian Fanslau gave us one, and MNGRR two, original Eames vacuum brake cylinders, 1880's vintage. 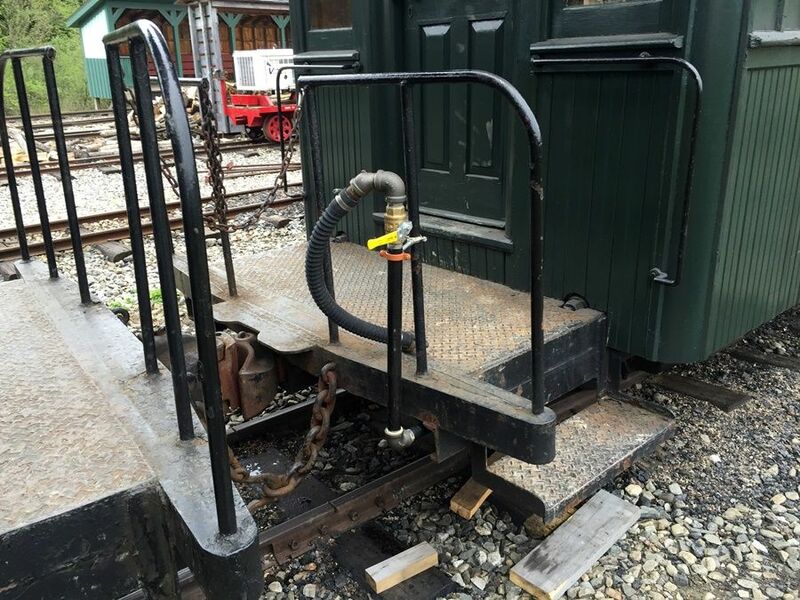 They fit the mounts on coach 3 perfectly, and look like coach 3's original vacuum cylinders (different style than no 9's). The Eames cylinder can be used either straight or automatic. The 3 oven to us are all of B&SR lineage. 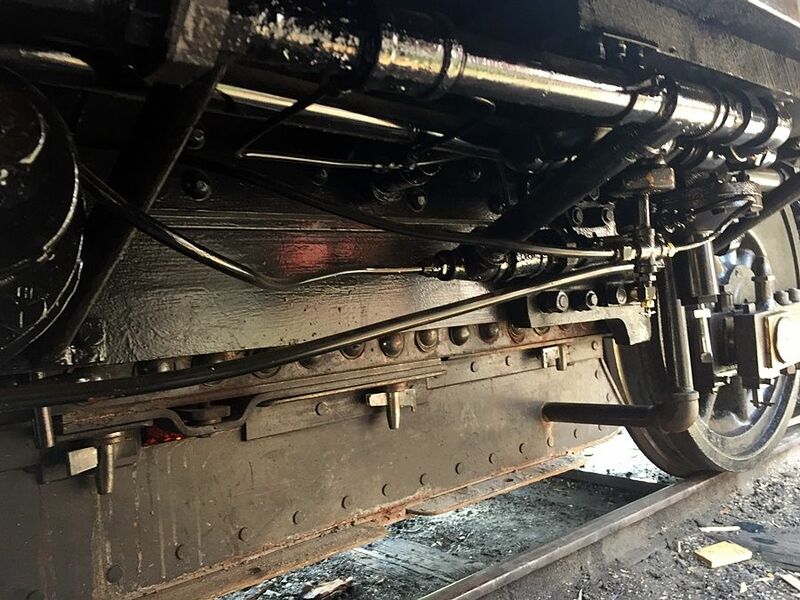 The control equipment is far less visually intrusive on a locomotive than a westinghouse system would be- everything mounts under the cab (except the engineer's valve of course). 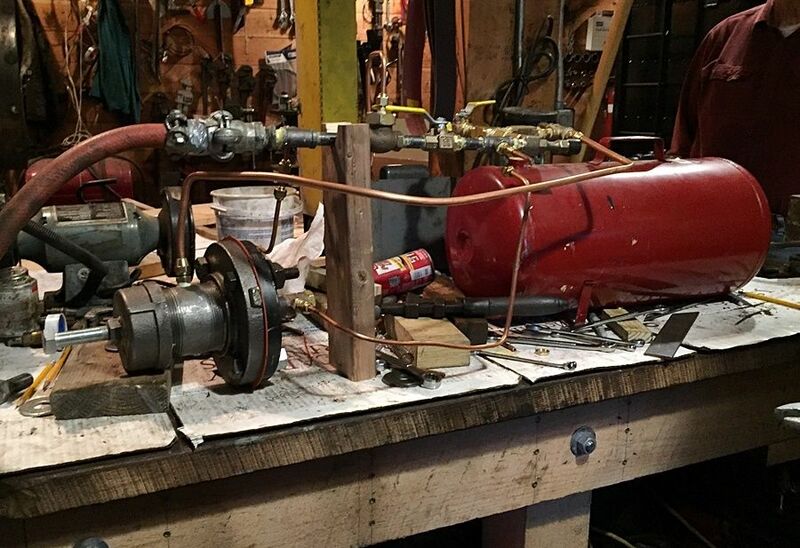 There's a governor, a small reservoir, an engineer's valve, and an equalizing valve. An emergency dump valve will also be provided. 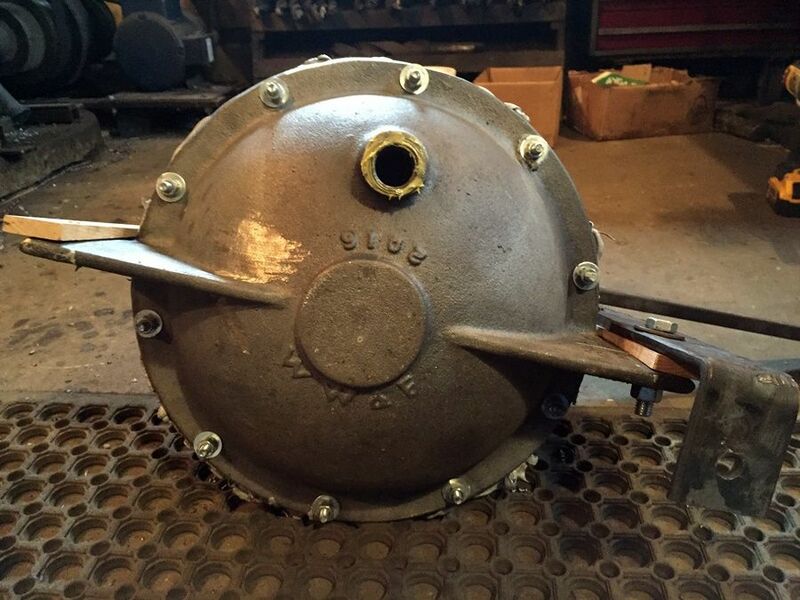 The steam loco auto brake equipment is stand alone and can be removed quickly to restore an engine to its original state. The origins RR didn't use auto- but it's a modern accepted industry standard to use an automatic brake; the safety it provides justifies its use. We feel that adopting the Eames auto system is only a slight exaggeration of what the original railroad did- in keeping with technology of the era, and providing low visual impact on the equipment. Very similar to our theory on no 9's new frame casting being drawn from a historical dwsign. Jason, the part about no triple valve sure is intriguing. 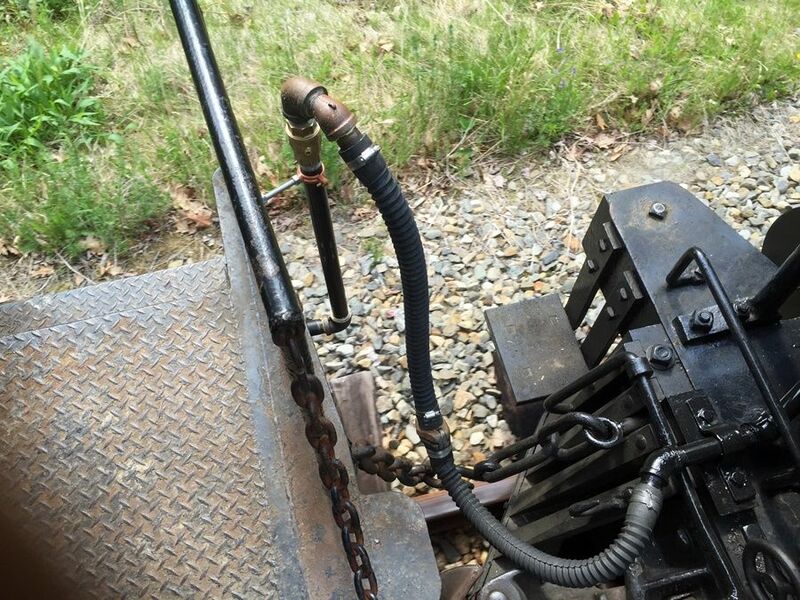 You mention this is a historical Eames automatic train brake design, hence this question: Is there a schematic of this system somewhere on line you could refer us to? 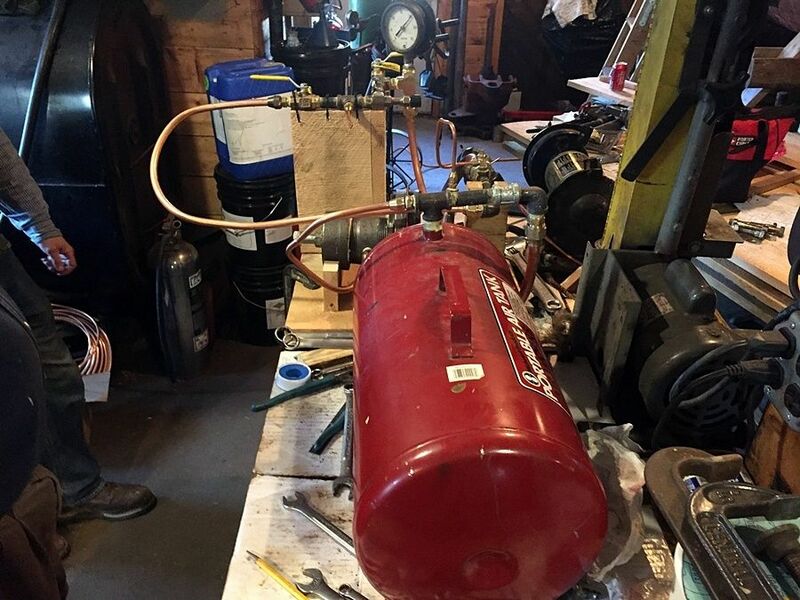 Today we had the first successful bench test of the engine control apparatus mockup on compressed air. 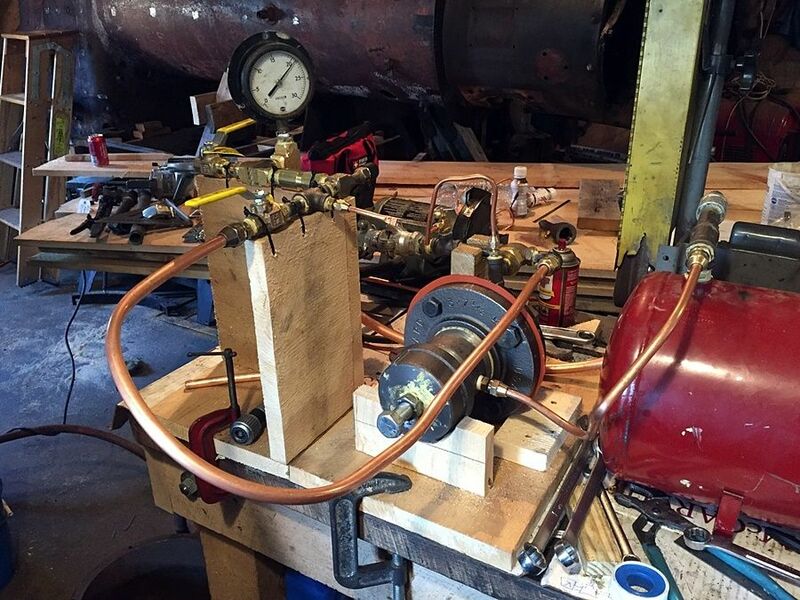 Today the test mockup was replumbed to closer resemble the installed plumbing layout in the locomotive and retested. 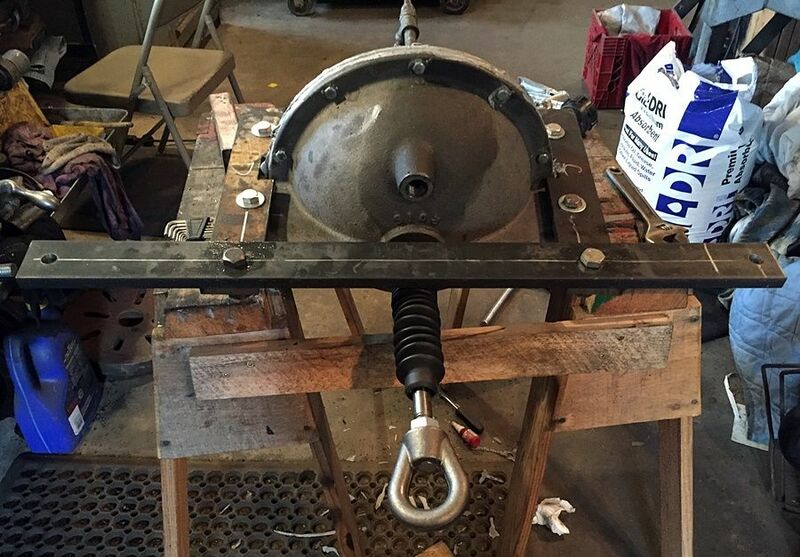 The shop crew plans to start building the next piece of the brake system during the coming week. After the next piece is completed the new piece will be plumbed into the existing mockup and bench tested. 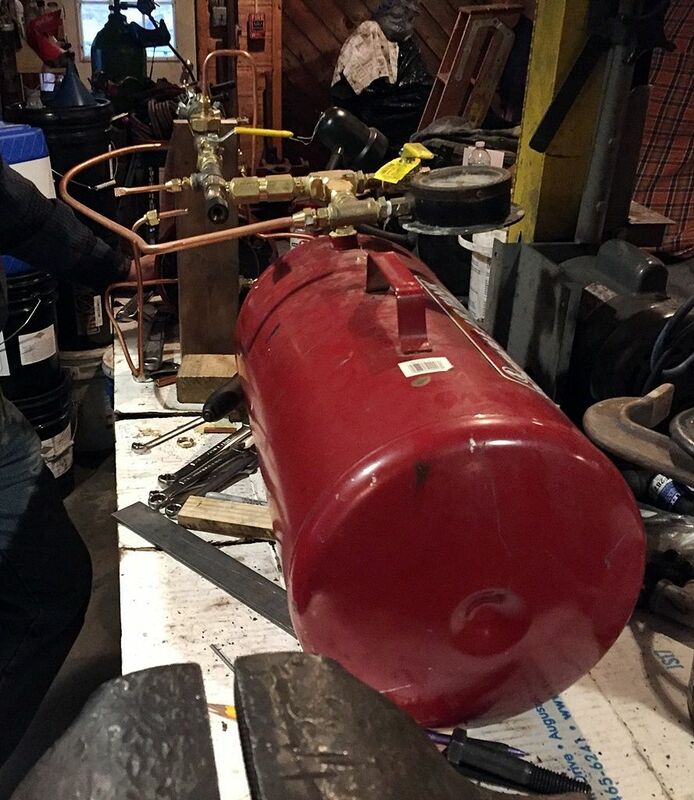 The pattern for the "pot" for the vacuum cylinders on the cars was delivered to Cattail Foundry on Thursday, along with two smaller parts for the system. They promised to have them available for me to bring to Maine for the spring work weekend. 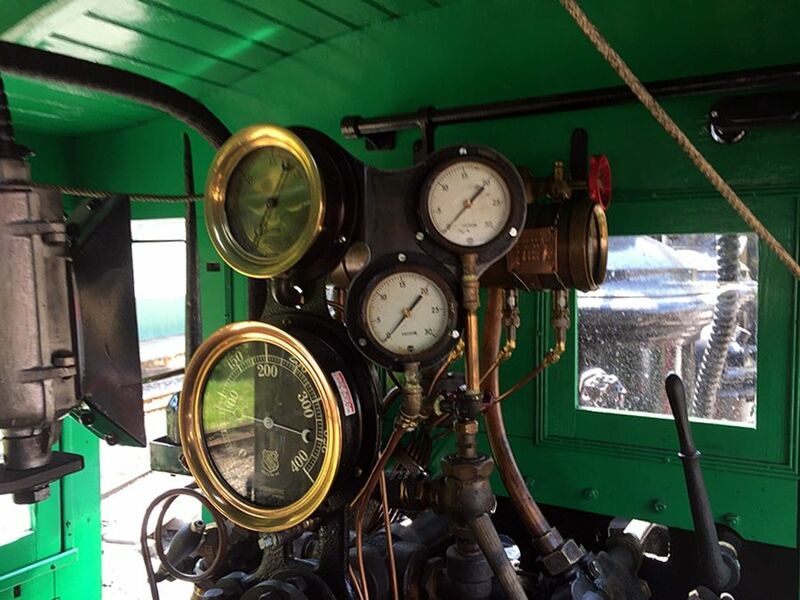 On Wednesday 5/25 we tested the vacuum brakes on coach 8. The test was considered successfull and revealed some items that need a little work. Coach 8 needs some changes to the brake rigging and the brake control assembly on 9 needs a little tweaking. Firing up 9 for the brake tests. Assembled vacuum brake pots before installation under coach 8. Backside of a brake pot. 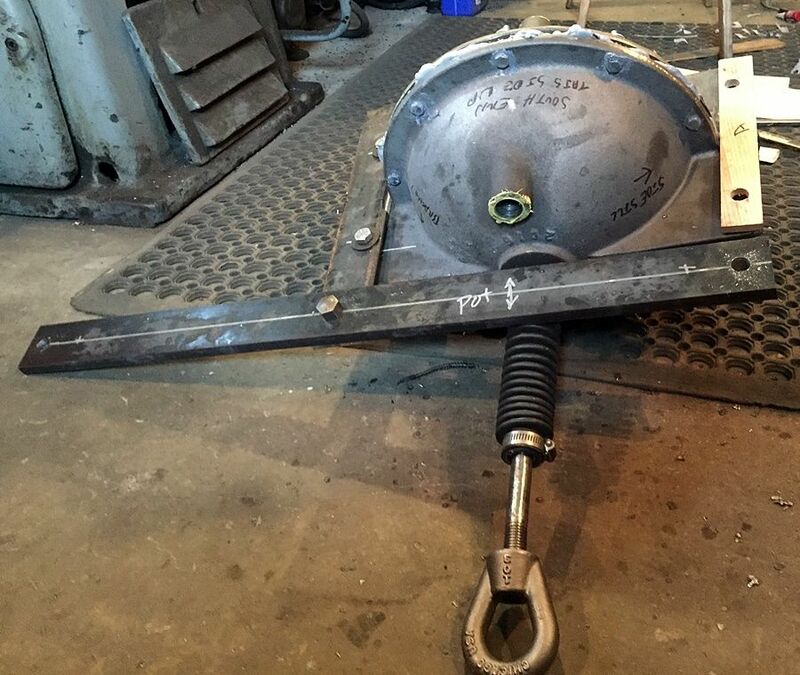 Brake pot being vacuum tested for leaks before installation. 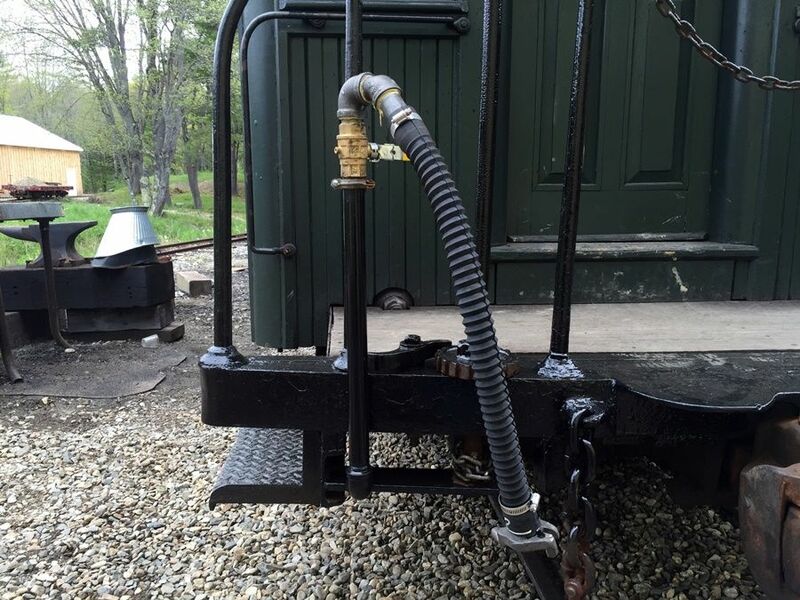 Vacuum reservoir installed under coach 8. The yello arrow is pointing at the bottom of a brake pot. Jason and Randy working on installing a vacuum pot. 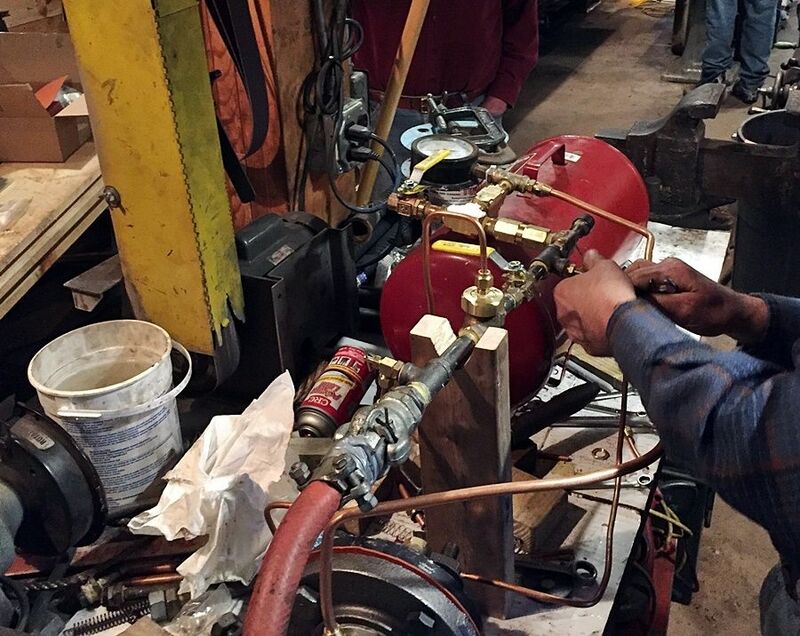 Randy and Phil working on brake piping. 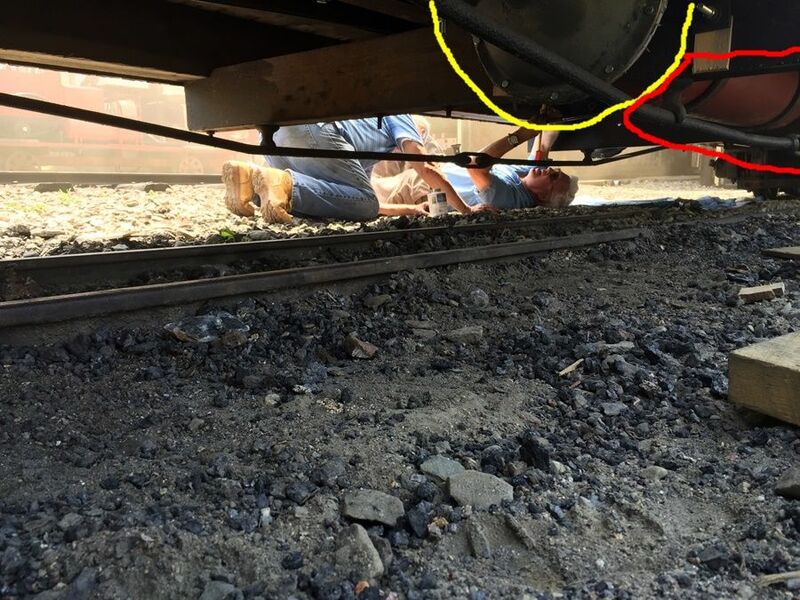 The brake pot is circled in yellow and the brake vacuum reservoir in red. 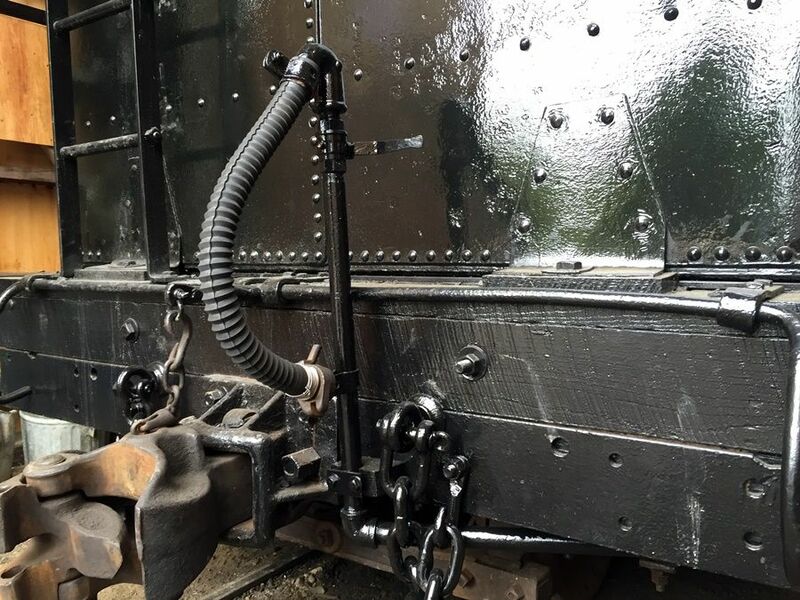 Brake hoses on coach 8. Brake hose ends. 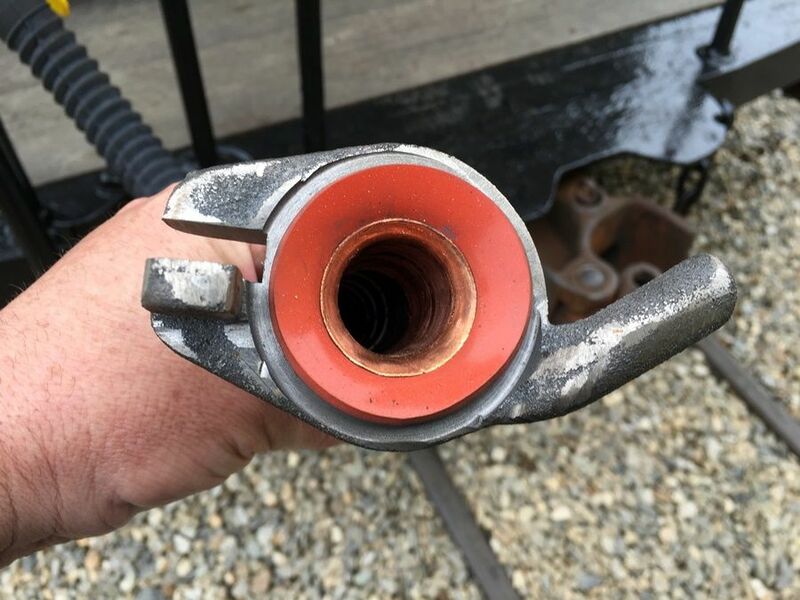 The connectors were cast from a pattern made from an original WW&F brake hose connector. Brake hoses on no. 9. 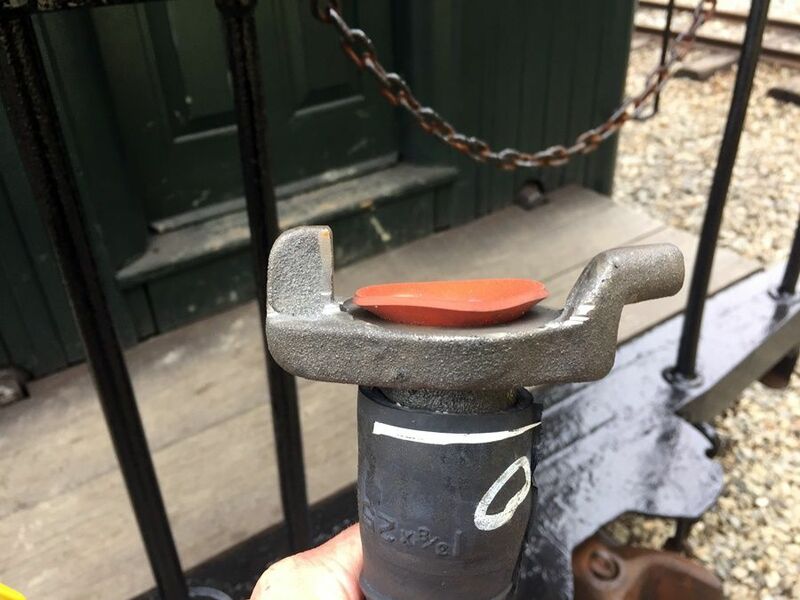 The rear brake standpipe is an original from the railroad. 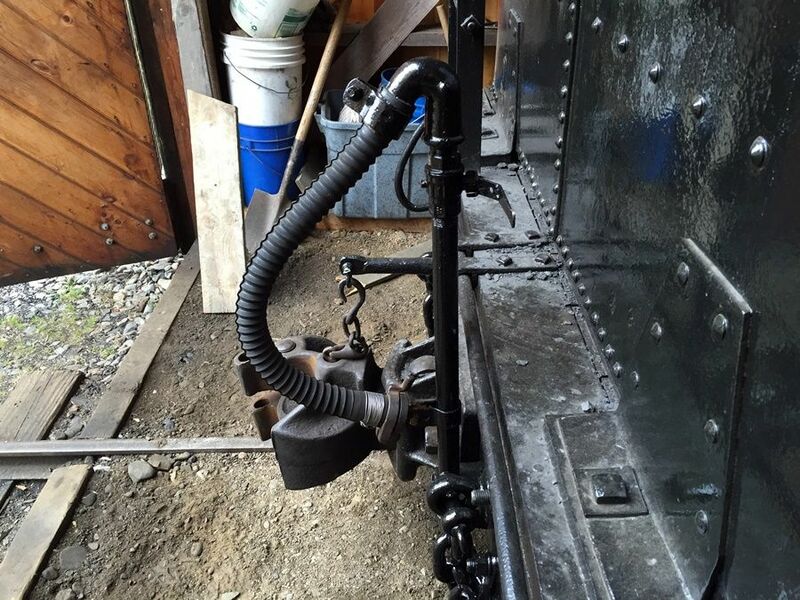 9's front brake hose and trainline plumbing. Train brake control equipment mounted under the engineer's side of 9. This is the same equipment that was used for the bench testing. 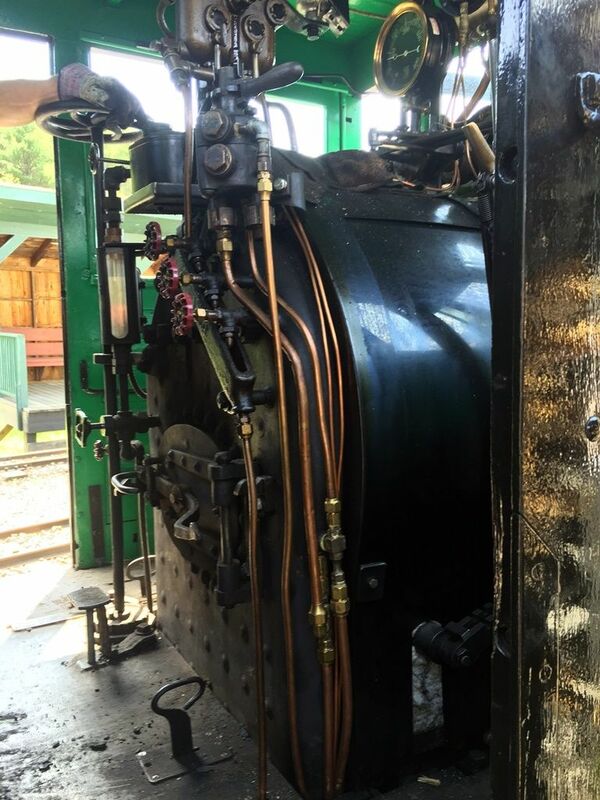 Temporary train brake control valve mounted on 9's backhead. 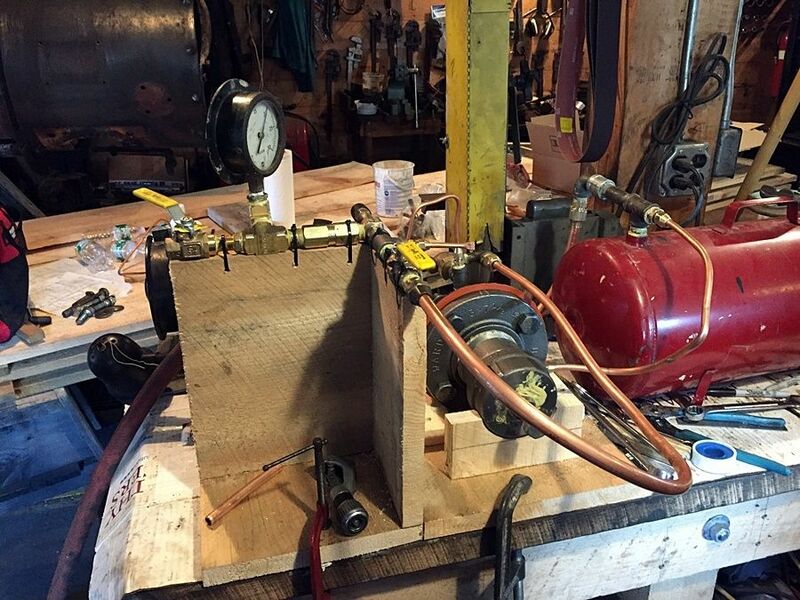 The valve is a trolley air brake valve modified to work with vacuum. After the system is working the valve will be replaced with a cast Eames style valve. Vacuum gauges for the train brakes. One gauge is for trainline vacuum and the other is for brake application. 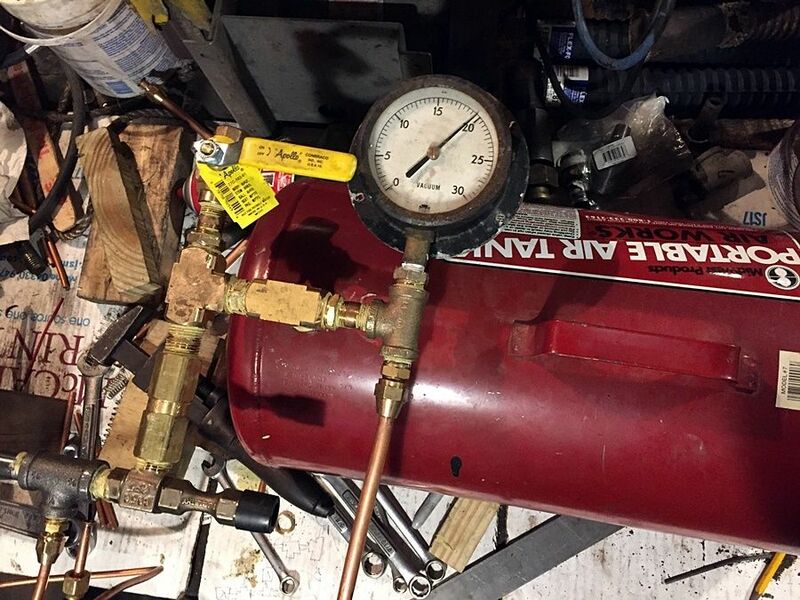 ( If anyone has a duplex vacuum gauge kicking around we would really like one. ) The original Eames vacuum gauge above the steam pressure gauge is for the seperate engine brakes. Don't know if I ever read or it was explained why stand pipes at end of cars. 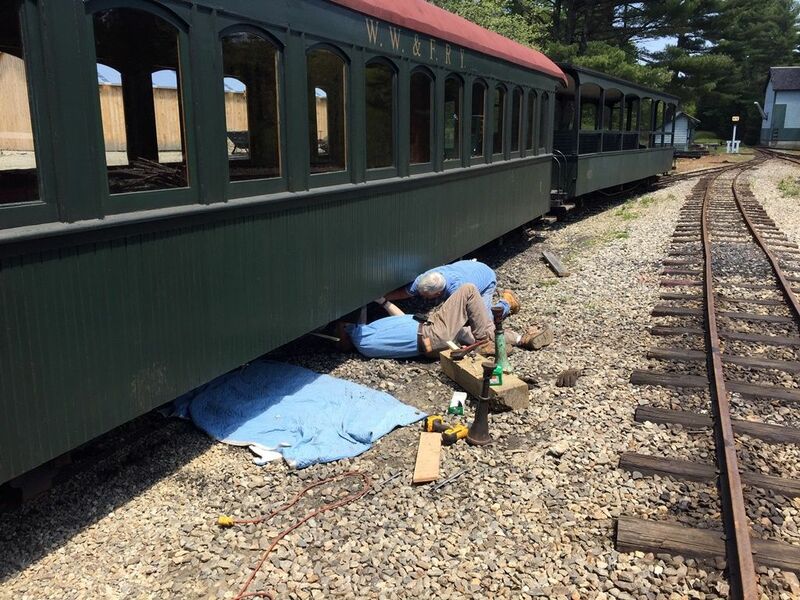 Other than the plumbing is lower to the ground compared to the wide gauge cars. Some of the WW&F cars had standpipes and some cars just had the brake hose coming out of the end sills. Stand pipes are pretty common on vacuum systems all over the world. Standpipes cause the hose to come down to the coupling from above. This is necessary as the coupling relies on gravity to hold it together until a vacuum is pulled. Thanks so much for the great photo & caption coverage of this fascinating project! Thanks for the photos. They are just what I need for the Dailey Grant Application. I have duly purloined them. Do these vacuum hose couplings break apart like glad hand couplings do? Or must they be broken by hand? They pull apart readily on their own; they need to in order to function as an automatic brake. They are very simple compared to air brake glad hands as the vacuum holds them together. 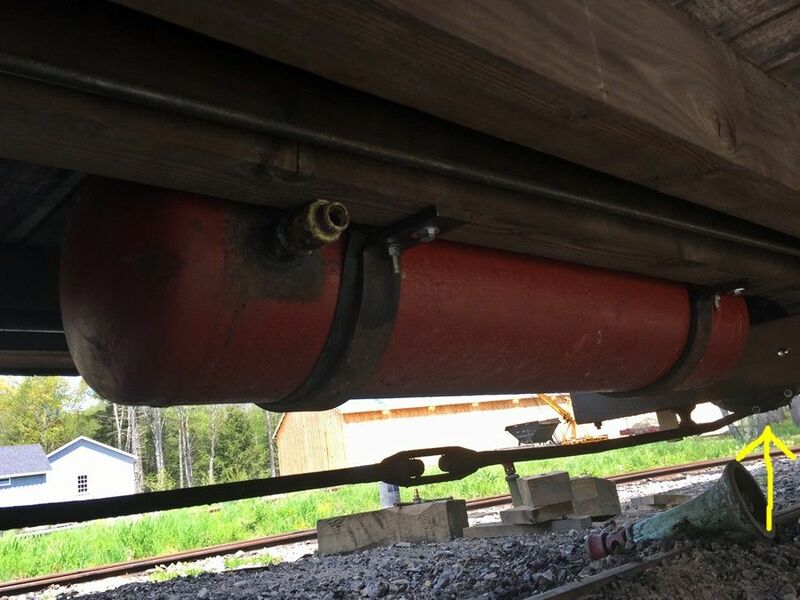 They have a crooked leg and a tab/slot which keeps them aligned and together after manual assembly and prior to pulling a train pipe vacuum. They are Eames all the way. We have two originals and have made several copies. 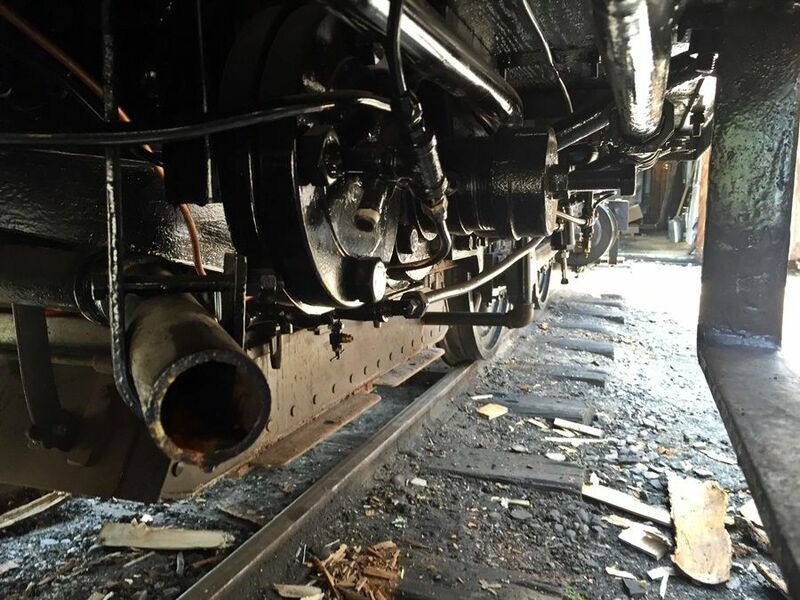 What kind of brake rigging adjustments were needed on Coach 8? Or maybe the better question would be what did we learn on Coach 8 that can be transferred to the other rolling stock?